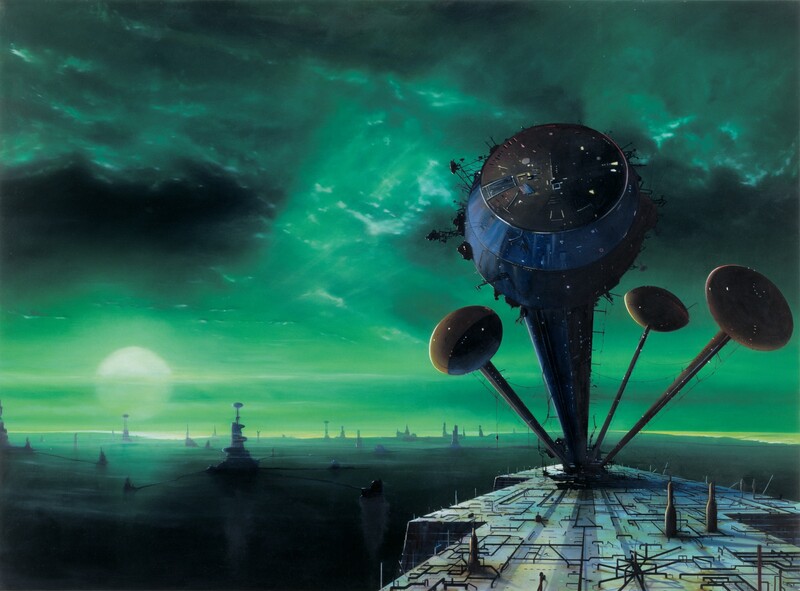 During the 1990's I made a number of science fiction paintings, based on book illustrations by Chris Foss (b.1946). Most of these were monumental in size. However, here the subject of the work seemed to call for a more intimate scale. The strange world depicted is in many ways similar to John Martin's depiction of biblical scenes hanging in this room. I tried to create a religious sense of wonder as the sun slowly sets in this alien world. The hazy green light gives a disquieting sense of melancholia, where exactly are you and what you are looking at? The title, Everyone Sang, refers to a poem by Siegfried Sassoon (1886-1967), which describes the horrors he saw in the trenches during the First World War, while satirises the honour and nobility of soldiers willing to die for their country.